I'm not a Professional product developer. But my EA works Really great. Sometimes this EA might not properly work on strategy testers. So don't rely on strategy tester results. No News filter added to this free version. The minimum deposit is 100 USD, the recommended timeframe is 1h. 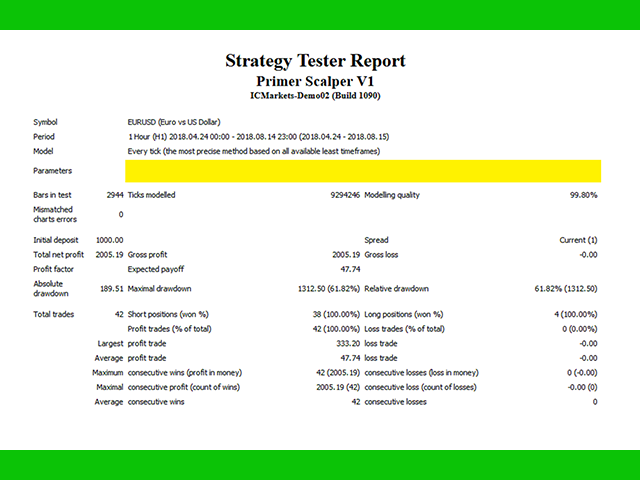 Use a broker with good execution and with a spread of 2-5 points. A very fast VPS is required, preferably with a latency of no more than 3. But I recommend to Subscribe Signals is the best rather than running this EA. Una auténtica basura. La gente da estrellas porque es gratis y yo valoro si funciona bien o no. En este caso esto sirve para perder dinero. Esto es un auténtico despropósito. No tocar. Small gains and big lost like almost scalper ea! Just download it. Let's try this. Comments free version as for request.